A parliamentary report of 1777 recorded a parish workhouse in operation at Stratton for up to 20 inmates. Cornwall: St Genny's (2), Jacobstow (2), Kilkhampton (3), Launcells (2), Marhamchurch (2), Moorwinstow (3), Poughill, Poundstock (2), Stratton (4), Week St Mary (2), Whitstone. Later Addition: Stratton and Bude (from 1900). The population falling within the union at the 1831 census had been 9,084 with its parishes ranging in size from Poughill (population 360) to Stratton itself (1,613). The average annual poor-rate expenditure for the period 1834-36 had been £3,628 or 8s.0d. per head of the population. 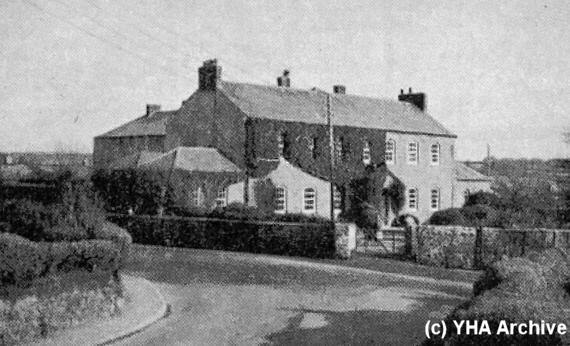 The Stratton Union workhouse was built in 1856 on a site at the west of Stratton. The workhouse location and layout are shown on the 1906 map below. It had a main block with a T-shaped layout, with a separate building, possibly an infirmary, to the north. Stratton workhouse from the south-west, c.1939. After 1930, the workhouse was redesignated as the Hillhead House Public Assistance Institution under the control of the Cornwall County Council. Exactly when the Institution closed is unclear but in 1939 the building was taken over for use as a youth hostel. It ceased operation later the same year following the outbreak of the Second World War. The workhouse buildings have been demolished and the site is now occupied by industrial premises. Stratton former workhouse site from the west, 2001. Cornwall Record Office, Old County Hall, Truro, Cornwall, TR1 3AY. Few records survive. Holdings include Guardians' minute books (1869-1929); Ledgers (1902-30); Relief order book (1930). YHA Historical Archive at Birmingham University. Thanks to John Martin and the YHA Archive for the picture and information.